Everything- we thoroughly enjoyed the spacious and well appointed accommodation particularly the large kitchen and the big dining table, where we enjoyed a great meal of local produce. We were told by a local that the shop next door was the best cheese shop in town! Certainly the cheese we baught was very good. The location was perfect and the room was large. No air conditioning but they provided a large fan. The room was decorated nicely and the shower was great! Kitchen on site was clean and well stocked. The room was clean when we arrived. It was nice having a kitchen and separate refrigerator that was for our room only. The outdoor patio was also nice. This property is outstanding! It far exceeded our expectations. Located near the Carcassonne Cite, it makes for a perfect place to stay when visiting the area. Jean greeted us at arrival and helped us check-in with ease. We stayed in the 3-bedroom apartment and it was more than enough room for our family of 5 (with 1 teenager and 2 younger children). It was exceptionally clean, beautifully decorated, and the kitchen allowed us plenty of room to cook dinner and enjoy the local lifestyle as a family in the dining area. There is a lovely market next door with a really nice shop keeper who helped us with our cheese and grocery requests. It was a delightful stay. Would highly recommend this property to families traveling with children. Everything was superb, except getting in! (See below). Big and well designed room for three people, bath and toilet are separate, kitchen is separate and is big with all utensils you need to cook and to dine on the table. Convenient to buy food downstair and to dine in the restaurant few steps away. Parking on the street downstai or nearby and is free and easy. Worth for this price. The hosts were nice enough and the facilities were immaculate. The location was nice. I wish I had stayed for longer. 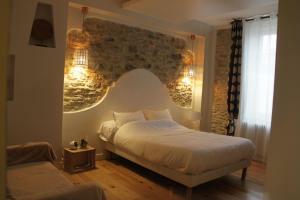 Lock in a great price for Le Logis GOUT – rated 9.1 by recent guests! One of our best sellers in Carcassonne! 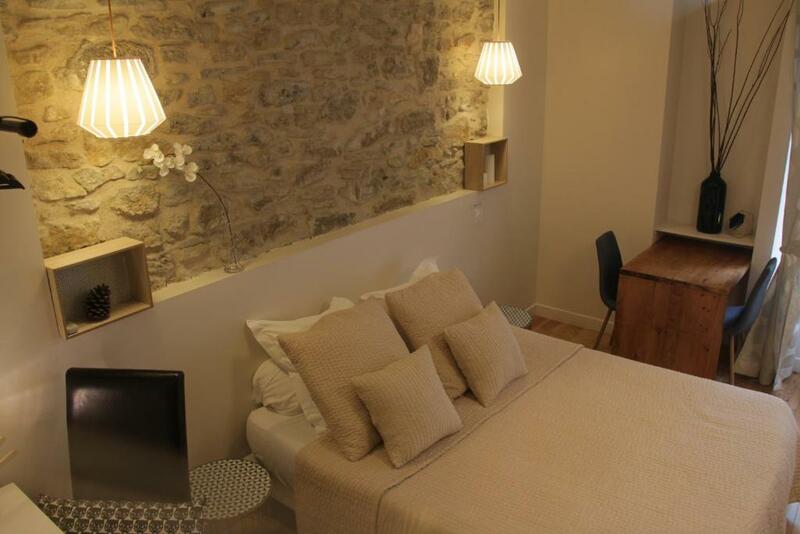 Located in a large house in Carcassonne, Le Logis GOUT offers a self-catering apartment and guest rooms. The property is south-facing and features a shared garden and sun terrace. Free WiFi is offered . All units feature a flat-screen TV and a private bathroom with a shower. The apartment has a kitchen equipped with a dishwasher and a balcony. 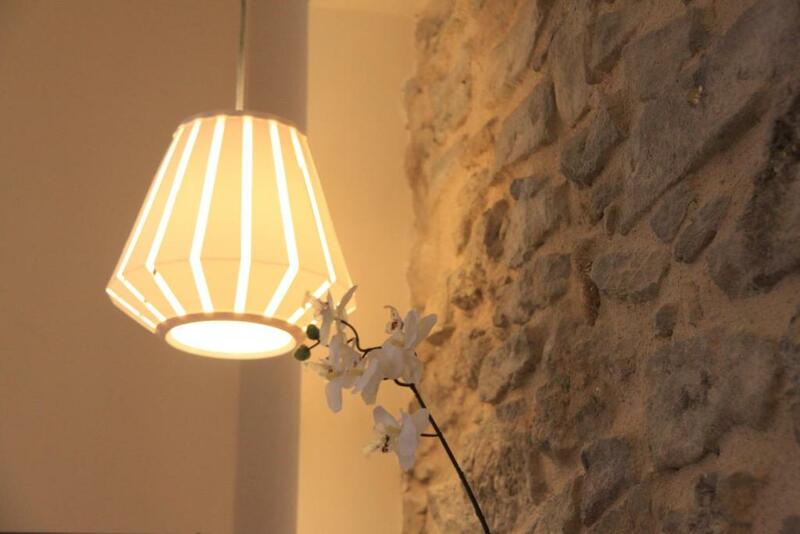 A number of shops and restaurants can be found just 650 feet from Le Logis GOUT. The nearest airport is Carcassonne Airport, 2.5 mi from Le Logis GOUT. 뀐 Located in the top-rated area in Carcassonne, this property has an excellent location score of 8.3! 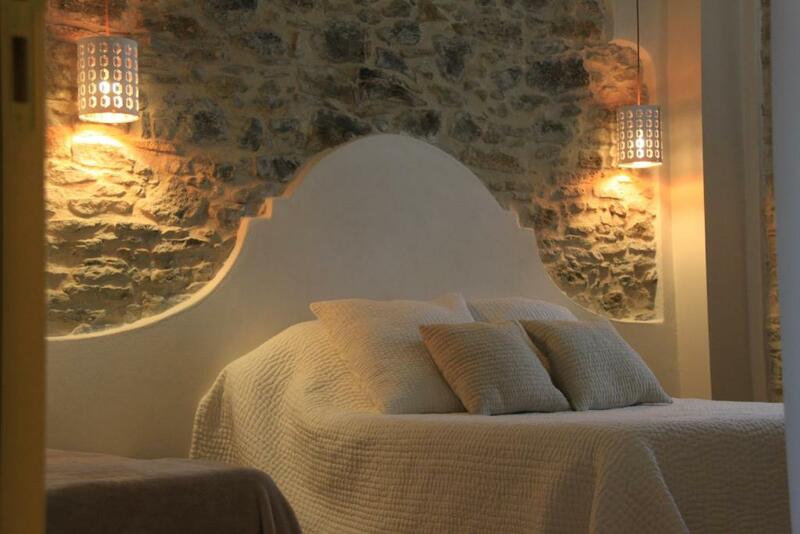 When would you like to stay at Le Logis GOUT? Located on the 1st floor, this bright apartment has high ceilings and wooden parquet floor and stone walls. 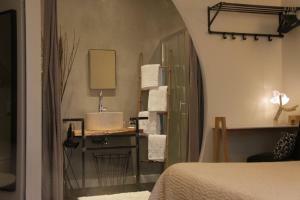 It offers 3 spacious bedrooms, one with a private shower room. It also includes an equipped kitchen/living room, a bathroom with bathtub and toilet, and a separate toilet. Set under the attic, the bright living room features a TV corner. A welcome/cleaning kit is available on arrival. Heating, WiFi access, and cleaning are included in the rate. Guests have access to the shared garden. Located on the ground floor, this room has a private shower room, toilet, a sofa bed and a flat-screen TV. It is south facing, and features a warm décor as well as wooden parquet floor. There is also a shared kitchen that guests can use, which includes a fridge, microwave, coffee machine, toaster, stovetop and crockery. Please note that coffee, tea, jam, milk and cereals are available for your use. Located on the ground floor, this double room has a private shower room, toilet, a flat-screen TV and a sofa bed. It features a warm décor, parquet wooden floor, and access to a private terrace. There is also a shared kitchen that guests can use, which includes a fridge, microwave, coffee machine, toaster, stovetop and crockery. 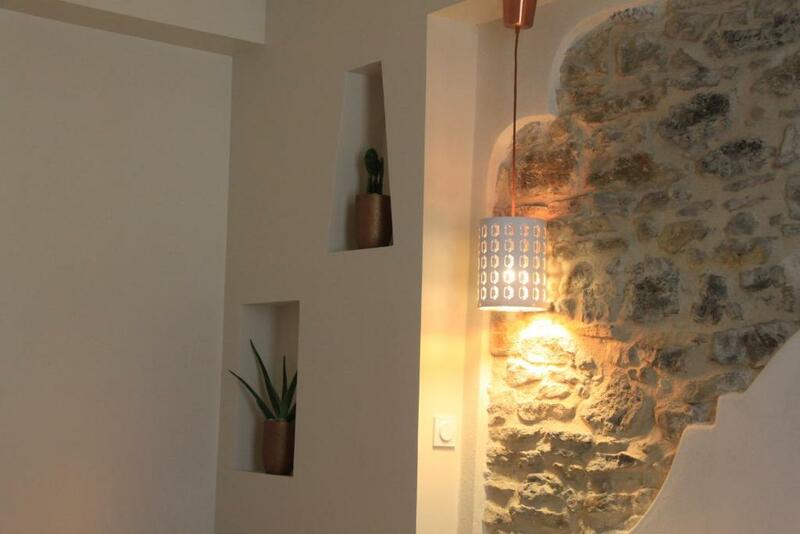 Cette Maison de caractère, très lumineuse, plein sud avec jardin intérieur vous propose : - au RDC 2 chambres individuelles (2 à 3 pers) avec Salle d'eau et WC privés, donnant accès à un espace petit déjeuner et au jardin communs (Le Logis A et C). - au 1er Étage, vous découvrirez un appartement de 140 m² (Le Logis B) 3 chambres 2 à 10 pers, entièrement équipé. Rénovation complète en 2016 Possibilité de privatiser l'ensemble pour une capacité allant jusqu'à 16 personnes Pour toutes demandes spéciales (équipement bébé, lit d'appoint, …) n'hésitez pas à nous contacter. Au cœur de Carcassonne, à 5 minutes à pied du centre ville, à 15 minutes à pied de la Cité médiévale (5 minutes en voiture). Vous rejoindrez les jardins du bord d'Aude entièrement conçu pour les piétons et les cyclistes et vous vous laisserez guider pour atteindre la magnifique Cité Médiévale Épicerie de quartier "Chez Marc" au pied du logement et nombreux commerces à proximité. Le logement se situe dans un quartier très apprécié des Carcassonnais. Facilité d'accès et de stationnement. 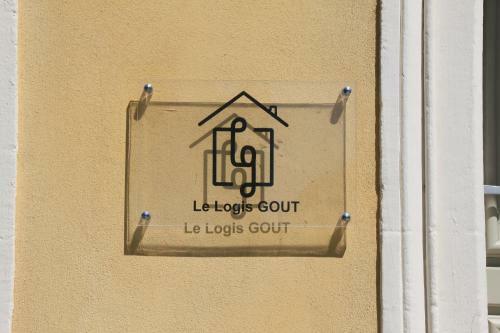 House Rules Le Logis GOUT takes special requests – add in the next step! Booking.com takes your payment on behalf of the property for this reservation. During your stay, you can pay for any extras using Visa and UnionPay credit card . Please note that children aged less than 2 years old pay EUR 5 per night using a baby cot. The maximum number of baby cot per room is 1. Please note that extra bed or baby cot must be confirmed by the property. Please note that extra charges must be paid separately on site. 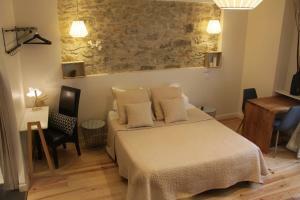 Please note that a deposit of EUR 300 must be paid on arrival for the Three Bedroom Apartment. This will be returned at check-out, subject to a damage inspection. 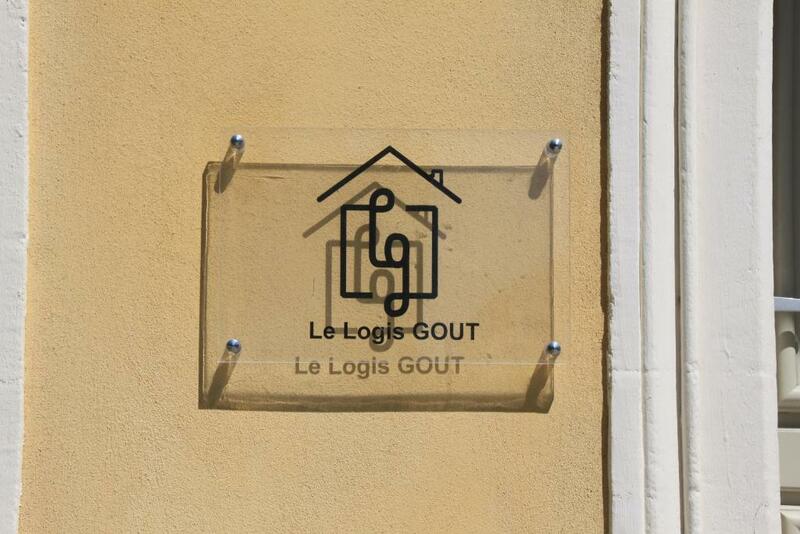 Please inform Le Logis GOUT of your expected arrival time in advance. You can use the Special Requests box when booking, or contact the property directly using the contact details in your confirmation. Kitchen saucepan was past it's prime - could do with replacing as it burnt our pasta. WiFi was great but no reception upstairs in lounge area. Very clean except some hairs left in the bath when we arrived. Little touches like toilet roll, kitchen roll, washing up liquid, dishwasher tablets, coffee pods and games really appreciated. Nice and peaceful. Gorgeous decor and very spacious. Super friendly and helpful host. Great room, super cute decoration, breakfast room was handy. Didn't see the staff at all but great communication and very effective check in! Beautifully designed and comfortable. Everything you could want in a fantastic three bedroom home. Attention to detail was amazing. Just stunning. Will be going back and will be telling everyone I know about it. Air ventilation could have been better, as we'll as soundproofing. Very nice and clean place, easy to access. Parking near and free. Big spacious 3 bedroom apartment. Exceptionally clean and very tastefully decorated. Slight problem with heating but it was dealt with very promptly. Wonderful deli next door. About 25 minutes walk from old town. Would definitely return. Host Jean very helpful. Would prefer to be met by the manager. Very practical, easy to understand how to enter the room. Decoration is really nice, the room had a small terrace and it was confortable and clean. Totally recommend. The only thing was the poor soundproofing between floor levels. Sounded like elephants were walking upstairs but then all was quiet by 11pm!! Tried to phone the owner/manager several times. Left messages, but no reply. Plenty of space for the four of us. Investing in a router extender to provide internet connection in the upstairs TV/Sitting area would be a good idea as our kids like to watch Netflix or stream movies when at home but this wasn't possible with very weak Internet connection. This was just a minor gripe as the Internet connection was great around the rest of the house. Be aware this is a house that has been converted to self catering apartments so you need to be aware that other residents at the bottom of the stairs can hear just about every noise you make when they are in the communal kitchen so you feel a bit embarrassed even shouting on the kids. Apartment was fantastic with lots of space and facilities and very clean. We were there on holiday with 3 young children who also loved it and the toys and movies available were an additional bonus. We would definitely stay here again and would happily recommend it. Excellent location, in quite area, completely refurbished building in a cosy modern way, carefully arranged, paying attention to every detail. Our apartment was very spacious (we traveled 5 persons) and very well equipped! The check in and check out system very clever! Wé’ll defenetely return!